GENEVA – The State University of New York at New Paltz women’s cross country team earned second-place out of 14 teams at the Hobart and William Smith Invitational on Saturday morning, which served as the final tune-up for the State University of New York Athletic Conference (SUNYAC) Championships. New Paltz took the runner-up spot with 33 points, just one more point than Clarkson, which earned 32 points to place first. Host William Smith rounded out the top three with 89 points. 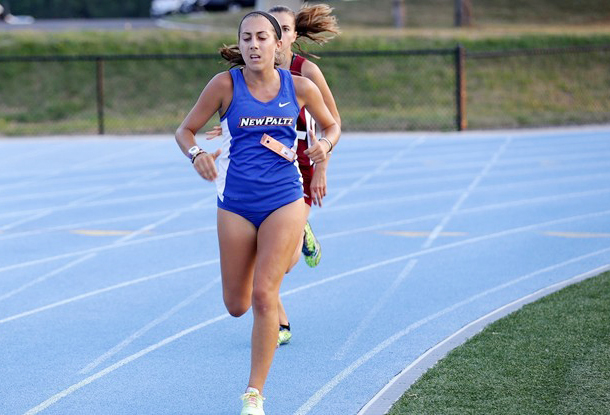 Senior Rebecca Verrone placed first for the Hawks and second overall, covering the six-kilometer course in 23:31.4, while freshmen Emily Cavanagh [23:38.7], Sherri Metcalfe [24:13.5] and Amanda Engrassia [24:40.4] earned fourth, fifth and ninth-place, respectively. Freshman Brenna O’Brien just missed the top-10, earning 12th-overall with a time of 25:00.7. Freshman Katherine Paul [25:57.9] and junior Monica Abrams [26:00.3] finished in sequence, earning 20th and 21st-place, respectively. Freshmen Vanessa Morgan [26:29.0], Marlana Krulish [26:41.1] and sophomore Paige Golembeski [26:50.0] followed behind to finish 27th, 28th and 29th, respectively. Sophomore Wendy Gonzalez [39th, 27:15.4] and freshmen Julia Eddy [50th, 27:45.1], Samantha Majuri [71st, 29:09.3], and Isabelle Kehrli [104th, 32:40.0] rounded out the New Paltz field.